Not to be confused with potassium ferrocyanide. 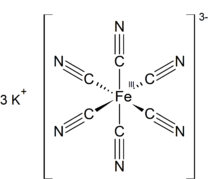 Potassium ferricyanide is the chemical compound with the formula K3[Fe(CN)6]. This bright red salt contains the octahedrally coordinated [Fe(CN)6]3− ion. It is soluble in water and its solution shows some green-yellow fluorescence. It was discovered in 1822 by Leopold Gmelin, and was initially used in the production of ultramarine dyes. Like other metal cyanides, solid potassium ferricyanide has a complicated polymeric structure. The polymer consists of octahedral [Fe(CN)6]3− centers crosslinked with K+ ions that are bound to the CN ligands. The K+---NCFe linkages break when the solid is dissolved in water. The compound has widespread use in blueprint drawing and in photography (Cyanotype process). Several photographic print toning processes involve the use of potassium ferricyanide. Potassium ferricyanide was used as an oxidizing agent to remove silver from color negatives and positives during processing, a process called bleaching. Because potassium ferricyanide bleaches are environmentally unfriendly, short-lived and capable of releasing hydrogen cyanide gas if mixed with acid, bleaches using ferric EDTA have been used in color processing since the 1972 introduction of the Kodak C-41 process. In color lithography, potassium ferricyanide is used to reduce the size of color dots without reducing their number, as a kind of manual color correction called dot etching. It is also used in black-and-white photography with sodium thiosulfate (hypo) to reduce the density of a negative or gelatin silver print where the mixture is known as Farmer's reducer; this can help offset problems from overexposure of the negative, or brighten the highlights in the print. The compound is also used to harden iron and steel, in electroplating, dyeing wool, as a laboratory reagent, and as a mild oxidizing agent in organic chemistry. Potassium ferricyanide is also one of two compounds present in ferroxyl indicator solution (along with phenolphthalein) which turns blue (Prussian blue) in the presence of Fe2+ ions, and which can therefore be used to detect metal oxidation that will lead to rust. It is possible to calculate the number of moles of Fe2+ ions by using a colorimeter, because of the very intense color of Prussian blue Fe4[Fe(CN)6]3. Potassium ferricyanide is often used in physiology experiments as a means of increasing a solution's redox potential (E°' ~ 436 mV at pH 7). As such, it can oxidize reduced cytochrome c (E°' ~ 247 mV at pH 7) in intact isolated mitochondria. Sodium dithionite is usually used as a reducing chemical in such experiments (E°' ~ −420 mV at pH 7). Potassum ferricyanide is used to determine the ferric reducing power potential of a sample (extract, chemical compound, etc.). Such a measurement is used to determine of the antioxidant property of a sample. Potassium ferricyanide is used in many amperometric biosensors as an electron transfer agent replacing an enzyme's natural electron transfer agent such as oxygen as with the enzyme glucose oxidase. It is used as this ingredient in many commercially available blood glucose meters for use by diabetics. Potassium ferricyanide is combined with potassium hydroxide (or sodium hydroxide as a substitute) and water to formulate Murakami's etchant. This etchant is used by metallographers to provide contrast between binder and carbide phases in cemented carbides. Prussian blue, the deep blue pigment in blue printing, is generated by the reaction of K3[Fe(CN)6] with ferrous (Fe2+) ions as well as K4[Fe(CN)6] with ferric salts. In histology, potassium ferricyanide is used to detect ferrous iron in biological tissue. Potassium ferricyanide reacts with ferrous iron in acidic solution to produce the insoluble blue pigment, commonly referred to as Turnbull's blue or Prussian blue. To detect ferric (Fe3+) iron, potassium ferrocyanide is used instead in the Perls' Prussian blue staining method. The material formed in the Turnbull's blue reaction and the compound formed in the Prussian blue reaction are the same. ^ Kwong, H.-L. (2004). "Potassium Ferricyanide". In Paquette, L. Encyclopedia of Reagents for Organic Synthesis. New York: J. Wiley & Sons. doi:10.1002/047084289 (inactive 2018-11-03). ^ Sharpe, A. G. (1976). The Chemistry of Cyano Complexes of the Transition Metals. London: Academic Press. ^ Ihde, A.J. (1984). The Development of Modern Chemistry (2nd ed.). New York: Dover Publications. p. 153. ^ Stroebel, L.; Zakia, R. D. (1993). "Farmer's Reducer". The Focal Encyclopedia of Photography. Focal Press. p. 297. ISBN 978-0-240-51417-8. ^ Nakajima, Y., Sato, Y., & Konishi, T. (2007). Antioxidant Small Phenolic Ingredients in Inonotus obliquus (persoon) Pilat (Chaga). Chemical & Pharmaceutical Bulletin, 55(8), 1222–1276. ^ Dunbar, K. R.; Heintz, R. A. (1997). "Chemistry of Transition Metal Cyanide Compounds: Modern Perspectives". Progress in Inorganic Chemistry. Progress in Inorganic Chemistry. 45. pp. 283–391. doi:10.1002/9780470166468.ch4. ISBN 9780470166468. ^ Carson, F. L. (1997). Histotechnology: A Self-Instructional Text (2nd ed.). Chicago: American Society of Clinical Pathologists. pp. 209–211. ISBN 978-0-89189-411-7. ^ Tafesse, F. (2003). "Comparative Studies on Prussian Blue or Diaquatetraamine-Cobalt(III) Promoted Hydrolysis of 4-Nitrophenylphosphate in Microemulsions" (pdf). International Journal of Molecular Sciences. 4 (6): 362–370. doi:10.3390/i4060362. ^ Verdaguer, M.; Galvez, N.; Garde, R.; Desplanches, C. (2002). "Electrons at Work in Prussian Blue Analogues" (pdf). Electrochemical Society Interface. 11 (3): 28–32. doi:10.1002/chin.200304218. ^ "MSDS for potassium ferricyanide" (PDF).